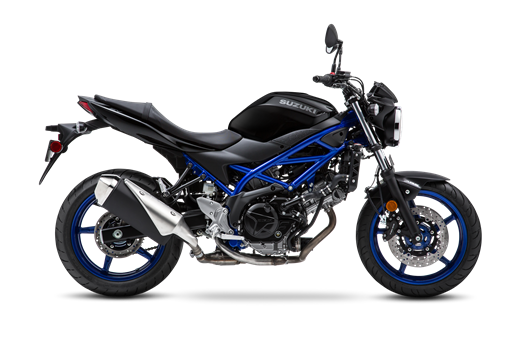 New for 2019, the SV650 ABS’s Glass Sparkle Black bodywork is accompanied by the frame and wheels in matching blue metallic paint. New, dual four-piston Tokico brake calipers up front grasp a pair of 290mm fully floating stainless steel rotors for great stopping performance. The compact Anti-lock Brake System (ABS)** matches the braking performance to the available traction. **Depending on road surface conditions, such as wet, loose, or uneven roads, braking distance for an ABS-equipped vehicle may be longer than for a vehicle not equipped with ABS. ABS cannot prevent wheel skidding caused by braking while cornering. Please ride carefully and do not overly rely on ABS.